Influence often subsists in the shadows. Behind every mainstream success there is likely a relative, teacher, local celebrity musician, obscure genre artist, or forgotten one-time star that helped shape their sensibilities. In 1956 a gifted but relatively obscure R&B singer and songwriter from San Diego by way of Oklahoma with a colorful sense of humor named Kent Harris recorded and released one of the more influential 45s of the mid-50’s R&B and early rock ‘n’ roll era. He did so under his equally unsung stage name: Boogaloo and His Gallant Crew. The single’s A-side was only a minor local R&B hit in Los Angeles but the 45 was a hugely influential two-sided record that would inspire Bo Diddley, The Rolling Stones, and, indirectly, The Coasters to record their own versions of the songs. Harris issued a string of singles as Boogaloo in the 1950’s and developed a decent career as a producer and songwriter for other West Coast R&B, soul and jazz acts. But he was self-admittedly first and foremost a songwriter, a gift that seemed to come to him naturally. I started doing that when I was just a kid…around the neighborhood where I lived. There were a lot of kids around there, playing around and stuff. And I used to make up songs about ‘em, make up different songs about different ones and the stuff they do. Everybody kind of liked it. It was a fun thing, and I just kept on doing it until I got a break. The B-side to his fabled 45 is a comical proto-rap called “Cops and Robbers” in which Harris recounts his misadventure in picking up a hitchhiker who in turn pulls a gun on him and forces him to wait in the car while the hitchhiker robs a liquor store. The joke, ultimately, is on the carjacker who in his confusion mistakenly gets into a police car after having robbed the liquor store. The song has been covered numerous times; most notably by Bo Diddley on his 1960 masterpiece Have Guitar Will Travel and later by the Rolling Stones as one of their earliest radio broadcast recordings. The Stones almost certainly learned it from the Bo Diddley version (they also recorded Diddley’s sensual-primal “Mona,” also from Have Guitar Will Travel). It seemed like an obvious choice for Diddley, whose entire milieu consisted of mixing funky grooves with quasi-spoken tall tales. The song is downright Diddley-esque in its absurdity and humor. But Bo Diddley also exuded a relentless bravado, which is undermined by the passiveness of the narrator. For this reason Diddley hated the song and only recorded it at the behest of his record label, the Chess subsidiary, Checker. That was one weird record! I didn’t really wanna do it ‘cause they had me talkin’ like a cissy, an’ I didn’t want that portrait drawn of me, of that type of dude. I finally cut it, but I was mad when I did, an’ I haven’t performed it more than ten times since. Whatever the merits of his reasoning Diddley, who fought outside influences with integrity throughout his career to maintain his carefully cultivated image, was right about one thing – the song was weird! And Diddley delivered a knockout performance despite his lack of enthusiasm. It certainly caught the attention of the young Rolling Stones, who included “Cops and Robbers” among the first handful of songs they recorded. Mick Jagger’s vocal is delivered with a charisma and earnestness that almost forgives the sense of per se inauthenticity in a middle class English kid from the suburbs trying to sound like a black American from the inner city. But the Stones, who studied and seeped themselves in black American music – especially in the early years while under the guidance of founding member Brian Jones – have no trouble catching the groove, complimented by Jones’ wailing harp. The A-side to Harris’ “Cops and Robbers” was another proto-rap comedy song, this one about shopping for men’s clothing called “Clothesline.” Here the narrator stumbles into a department store and enters into a verbosely hip exchange with the salesman in the men’s department who lays temptation on thick only to discover that the narrator has bad credit. No credit, no suit, no commission, no dice. Wrap it up. Jerry Leiber and Mike Stoller were two Jewish kids who met while attending Fairfax High School and Los Angeles City College, respectively. They immediately bonded over their shared obsession with black music and culture. They began writing songs together in the early 1950’s…Unlike traditional songwriting teams of the era, Leiber and Stoller weren’t (intentionally) writing the Great American Songbook, they were writing the blues…Their greatest earliest success came in 1953 with Big Mama Thornton’s recording of “Hound Dog,” later immortalized by Elvis Presley…More R&B hits followed including “Kansas City” (Wilbert Harrison), “Love Potion #9” (The Clovers) and “Ruby Baby” (The Drifters), as well as several iconic songs written for The King including “Love Me,” “Treat Me Nice” and “Jailhouse Rock.” Many would argue they reached an artistic apex with sophisticated pop records like “There Goes My Baby” or the magnificent Peggy Lee cabaret ballad “Is That All There Is?” – and perhaps they did – but it was with West Coast-based R&B vocal group The Coasters where Leiber and Stoller showcased the essence of what they were all about as tunesmiths. Coaster Billy Guy heard the Kent Harris record of “Clothesline” on the car radio one day and happened to mention it at a Coasters recording session. He couldn’t recall the entire song, or even its title or the name of the singer, but was able to convey the overall idea and certain specific lines and phrases. Jerry Leiber loved the idea and searched record stores all over New York City to find a copy of the mysterious song to no avail. So he did what any songwriter worth his salt would do – he wrote his own version incorporating the lyrics Billy Guy had sung. The idea was tailor-made for the hep Leiber, who had a thing for fine men’s clothes and had had department store imagery on his mind since relocating from Los Angeles to New York City. Our West Fifty-seventh Street office in Manhattan was on the top floor of a small building. On the street level was a store that featured women’s foundation garments. That meant girdles, corsets, and other intimate items. I liked watching the women who wandered into the store. I liked imagining what they looked like without their dresses…I liked the thought that while Mike and I were banging out ideas for songs, four stories below women were wiggling in and out of underwear. Unlike Bo Diddley, The Coasters were unconcerned about playing the clown. Usually, whichever Coaster was taking the lead on a particular track would essentially imitate Leiber’s vocal mannerisms. Because Billy Guy was the only one who had heard the original version, his vocal guidance is part Kent Harris and part Leiber-doing-Guy-doing-Harris. Guy’s resulting vocal performance as the hapless customer is a subtle, nuanced, self-deprecating hipster tour de force and, perhaps along with “Searchin’,” Guy’s finest moment vocally. Bassman Dub Jones (who replaced Bobby Nunn in 1957) also shines here as the slick salesman. Jones was a masterful vocalist who could handle leads on serious standards with the same command as his comedic deep voice Coasters parts. Guy and Jones playing off each other in “Shoppin’ for Clothes” are one of the great comedic partnerships, musical or otherwise. 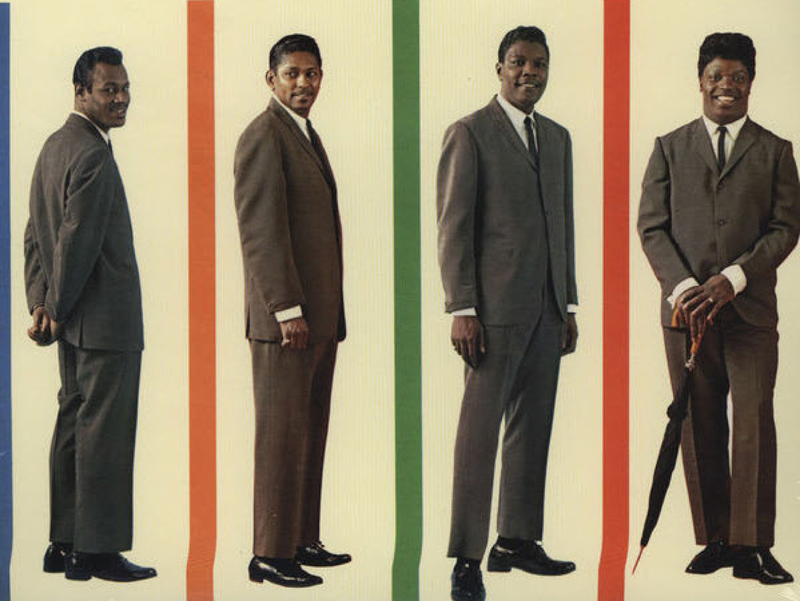 The Coasters changed personnel occasionally throughout their legitimate career (essentially 1955-1961). The classic lineup on most of The Coasters’ iconic hits such as “Yakety Yak,” “Poison Ivy” and “Charlie Brown” is the same lineup on “Shoppin’ for Clothes”: Billy Guy, Dub Jones, Carl Gardner and Cornell Gunter, who arranged most of the group’s harmonies, including “Shopin’ for Clothes.” Gunter, who was openly gay even in the 1950’s, was also built like a heavyweight with an 18-inch neck and served as the band’s muscle out on the road. (He once threw a would-be assailant across the top of a truck when the man went after a fellow Coaster after a gig.) Gunter was shot dead through the windshield while sitting in his car in Las Vegas in 1990. The murder remains unsolved. The thing is, life is hard. Riding high in April, shot down in May. Whether bullied by cops, criminals or store clerks, it is a cold and cruel world and it is up to us alone to assert our own dignity wherever it is challenged. The trick is, keep doing your thing. Kent Harris released an unheralded and practically unheard 45 record into the ether and it eventually reverberated around the world, affecting a group of kids in Britain who would become the biggest band in the world and directly influencing the most successful songwriting team of the time. Reach for the skies. Keep doing your thing. Try it on, stand in the mirror and dig yourself.